When I saw this message writ large on the departmental chalkboard this morning, I knew that none of my colleagues had written it, because we are not liars. This evening, I re-learned the joys of SPLASHING. Splashing in the sink! Splashing with the faucet! Splashing while holding a toothbrush! Splashing whilst someone stealthily washes your entire body without removing your clothing! (That last part was just me: the little one kept on pishposhsplishsploshing in the water at her feet; I sang her a song about how I was washing her ankles! and her toes! and her neck! and her ears!) This evening, she learned an ON/OFF game with hats. She also learned that flowered shorts make excellent floppy hats and can even prompt one's parents to don a towel-bandanna and a colander, just so everyone can wear a hat before dinner. 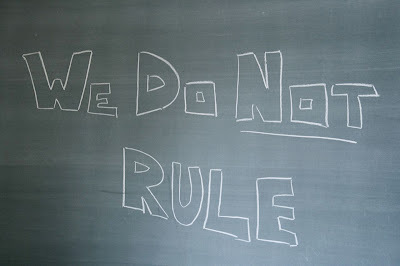 See how it is that I know that we do rule, in and out of school? Yeah. I thought you did.